This morning, Baird analyst, and Tesla cheerleader, Ben Kallo said that Tesla holders would likely push for a go-private price above the $420 per share that Musk suggested, and the stock price may top that mark as investors demand a higher premium and shorts cover positions. To be sure, with the stock trading over $50 below the LBO price, the market clearly sees "problems" with the deal as it is structured. Then there are the skeptics. Cowen analyst Jeffrey Osborne said that a leveraged buyout model wouldn’t work if existing investors were to remain as Tesla CEO Elon Musk claims they will. "The outcome largely hinges on what "funding is secured" means," Osborne wrote. "What are the plans for capital funding plans for going forward post the potential transaction? We continue to see the company’s capital needs as much higher than the company is able to generate from operations under optimistic scenarios." Short-sellers were even more vocal: "The market doesn’t believe him," said David Kudla, CEO of Mainstay Capital Management quoted by Bloomberg, which is shorting Tesla. "His credibility has come into question over a number of things. If this were real, you’d expect the stock to go closer to $420 a share than it has." 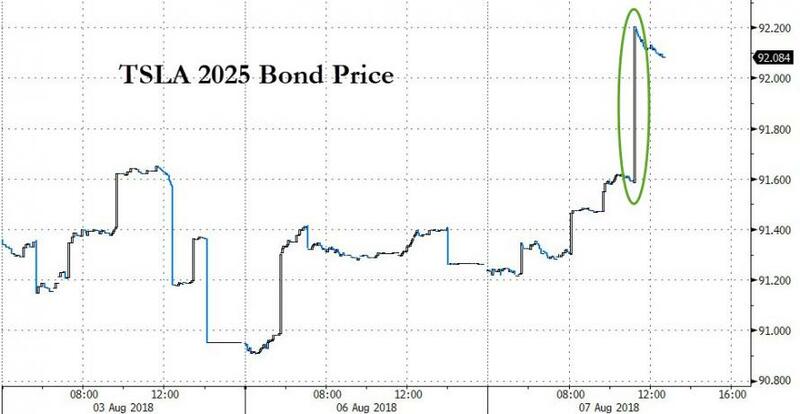 It's not just the stock that has doubts about the deal: as we showed yesterday, Tesla's bonds, which have a 101 Change of Control put, meaning they would trade to 101 cents of par in case of a take out, barely budged yesterday, rising only as high as 92.2 cents on the dollar. But the biggest question that remains is why, despite stating that "funding has been secured", did Musk not disclose where it is coming from. “It is important to note that, as of today, no details have been provided with regards to what ‘Funding secured’ means,” said Evercore ISI analyst George Galliers. "Depending on where the private funding may come from, going private may provide Tesla with deeper pockets from strategic investor and freedom from the volatility of public markets." Alternatively, and potentially a trigger for an avalanche of lawsuits, Musk could have simply fibbed, and sent out his tweet without either funding, or a discussion with lawyers of what the implications of his statement are. First, the context is odd: Musk promised on the conference call that $TSLA will be forever profitable. So why does he need to go private to "end negative propaganda from shorts"? And why let them off the hook at $420? First, Musk recently rebuffed an investment offer from Saudi Arabia. If you're passing the hat for the largest LBO syndicate in history, why say no to a big check? Second, a $70B syndicate would involve numerous banks, dozens of lawyers, and multiple boards of directors. It's been [over] 12 hours since the announcement, and none of these parties has confirmed Musk's claims. 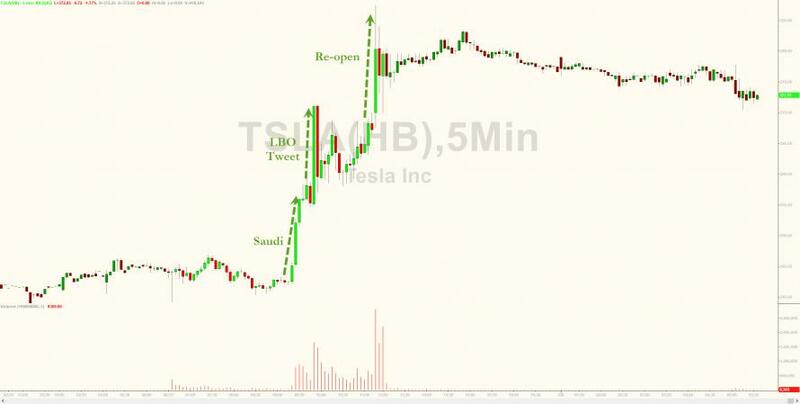 Why did $TSLA not request a trading halt until an hour after Musk's tweet? Why did the company belatedly post an email from Musk, rather than an official statement? Why did Tesla not file an 8-K disclosing details of the purported LBO? Musk says he will not sell in the deal. What about his ~$800M in margin loans? Will lenders accept illiquid collateral? What about change of control provisions on $TSLA's debt? Who will fund the mandatory tender? Why did Musk's initial tweets portray this as a done deal, if his subsequent email revealed it to be merely his intention? Were these plans in the works when Musk publicly predicted a "short burn of the century" and a short squeeze larger than Volkswagen? Were they in the works when he aggressively purchased $TSLA shares in the premarket? If this deal is real, it won't be wrapped up for at least 6 months, and probably longer: a) need to assemble an independent board to vote on the deal (a court ruling this year decided that $TSLA's board is not independent of Musk), b) need a proxy statement with extensive risk disclosures (some think this is why $TSLA couldn't take the Saudi PIPE in the first place), c) need a shareholder vote, d) need antitrust review, even if perfunctory. Meanwhile, cash burn continues - in order to avoid default on their ABL, they must have cash/avail on Jan 1, 2019 sufficient to cover both 2019 convert maturities as well as a $400M buffer. That comes to $1.8B. At June they had $2.2B of cash and are burning close to $1B per quarter. Tough math. Musk says shareholders won't be forced to sell. How does that work? 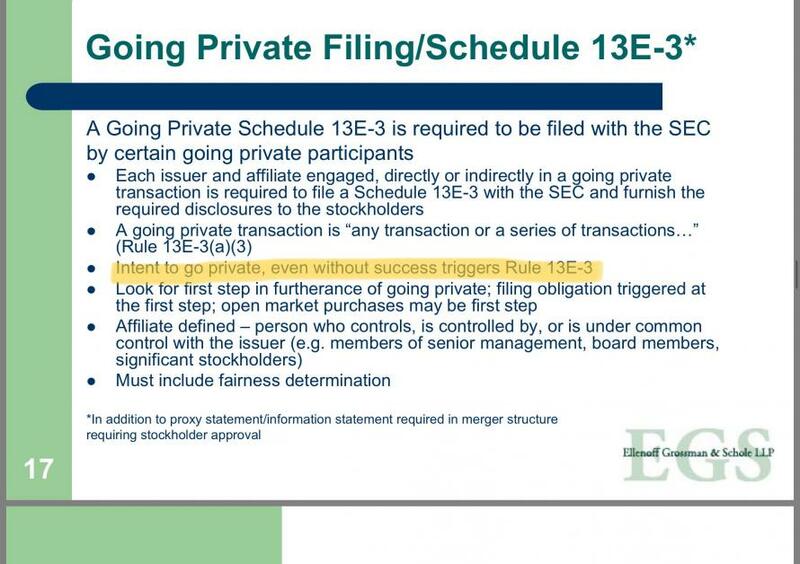 A private company with thousands of shareholders is still required to make SEC filings. How will unaccredited investors retain shares? The fact that none of these details was alluded to by Musk is further evidence that Musk has not discussed the deal with lawyers. Which brings us back to the question: how do you line up $70B in financing without involving a legal team? By now you will have deduced my skepticism that this deal is real. Gambits like this are not uncommon at penny stock companies facing liquidity problems. And Musk is facing liquidity and possibly regulatory problems. Is this his attempt to manage his legacy? To make fans think they were all about to be called up to the $70B rapture, but at the last minute the dastardly shorts and regulators pulled down heaven? For now the market remains torn: while the stock jumped on the double whammy of the Saudi investment news and the Musk going private "deal", the price is well below the $420 target price... and dropping in the pre-market. The good news is that the price of TSLA remains above the $359.8676 conversion price on some $920 million of convertible bonds due March 2019, giving the company the option not to pay down the note in cash but to convert it into more TSLA stock. And for Tesla whether private or not, with its multi-billion annual cash burn, and a rapidly declining cash balance, avoiding repaying this debt is critical. In fact, it may explain Musk's entire "half-baked" LBO diversion. Now the only question is if the regulators have also noticed and will finally start asking questions.